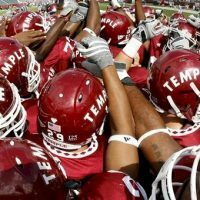 OwlSports Update reporters present a weekly recap of the latest Temple Football game before switching over to a live feed of Head Coach Geoff Collins' weekly conference, followed by a comprehensive break-down of news and comments revealed at the conference. Max Mirkin and Matt Bevenour are back for another episode of Inside the Nest after a devastating homecoming loss to UConn. They breakdown what went wrong, preview the upcoming game at Army, and Geoff Collins speaks to the press live at Edberg-Olson Hall. Jonathan Gilbert has more on Temple’s offensive missteps. Later, Max and Matt speak with John DiCarlo, editor of OwlScoop.com, to get his take on another hard loss.